OMG Wendy, they are already mature! How so beautiful. I don't see anything like that here, maybe they only grow well in cold climates. I was able to see them, the lacquered decors, in China. I know they are symbolic of good health, the wulu! But they are not as cute as those! The trellis heavy with vine and gourds hanging down is a sight to behold. The minature gourds are cute. 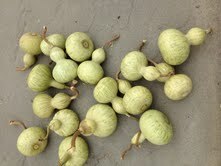 I have a few dried gourds which I bought while visiting China a decade back. They have Chinese art and calligraphy of auspicious words etched on with a blow torch. Your father is simply amazing; so industrious and equally productive. I've great admiration for him. What a process! I never knew about the scraping step but it really makes them look stunning. Two falls ago my dad had tossed some lacquered gourds in to his garden that were given to my mother as a little gift in a flower arrangement. We were tickled to see them sprout up the following season. Unfortunately ours did not come up this year. Thinking the weather played a big part in this. Your dad sounds so cool...how lucky you are! Amazing to read about this. Your father's garden always sounds so amazing. My attempts to grow gourds have all met with failure. Guess it's time to try again. Awww...they're soo cute!! Congrats to your dad for his beautiful gourd harvests!! I love these. Kudos to your father for his amazingly green thumb. And good luck to you on your presentation. I'm sure you will be well received. I hope you have a great time. Thanks for writing this post! I love to hear about gourds and gardening.